It was that time of the year again, Record Store Day 2019 had arrived, in other words: waking up early and queuing in front of our local record store. You must know I hate queuing except when it’s Madonna related LOL. Every year my brother in law Sander and me go to Velvet Music in Amsterdam. We met up later than usual at 7:30am in front of the store. To be honest I was there already at 07:15, too excited to wait at home. There was one guy in front of me, slowly more people arrived. We found out that we all wanted something else and decided to help each other to get the desired items. Which was doable because only 10 people were allowed in as pairs to get into the store. As soon as the shop opened almost everybody found the items they wanted. 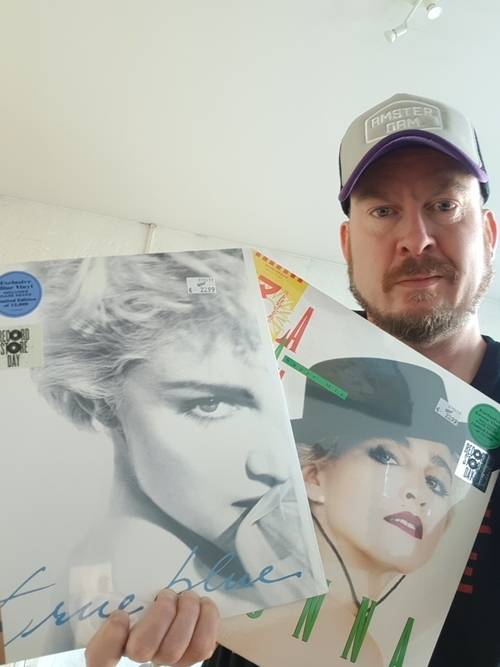 For me of course the 2 Madonna releases, and I got my hand on the only copy of Robyn’s Bodytalk white vinyl. It was a fun morning, chatting about music and the passion of collecting. Straight after I needed to go to work, so it was a long day. A long day with a smile on my face!